Every effective Incident Response team needs the ability to “ask a question” to a single or multiple hosts in the fleet and receive timely and accurate answers. Incident detection and response across thousands of hosts requires a deep understanding of actions and behavior across users, applications, and devices. While endpoint detection and protection tools can provide some lift out-of-the-box, deep insight and analysis of security-relevant events is crucial to detecting advanced threats. Palantir currently maintains an osquery deployment across Windows, Mac, and Linux systems to answer these questions. osquery is an open-source tool originally developed at Facebook that exposes operating system configuration data in the form of relational database tables. By issuing SQL-like queries against these tables, users can collect valuable data about the current state of the system as well as changes applied to it over time. The goal of this blog post is twofold: first, to provide configuration guidance for a multi-platform osquery deployment, and second to describe our open-source set of osquery configurations: https://github.com/palantir/osquery-configuration. The GitHub project provides the necessary building blocks and serves as a useful reference for organizations to rapidly evaluate and deploy osquery to a production environment. Our configuration represents a baseline security standard that can deliver immediate security outcomes for detection and response when used in conjunction with a centralized logging platform. Each of these incidents required the capability to ask a series of “questions” to the entirety of a fleet in order to identify impacted systems. This approach is much more thorough than simply enumerating installed packages on a host. Before we began, we already had two of these queries in place, and adding the two additional dnsmasq-specific queries only took a matter of minutes. Within 24 hours, we had a comprehensive list of hosts that had dnsmasq installed and could target them for removal/updates. osquery collects and aggregates a system’s log and status information in a collection of pre-defined tables. Users can interrogate the system state with SQL queries against these tables. 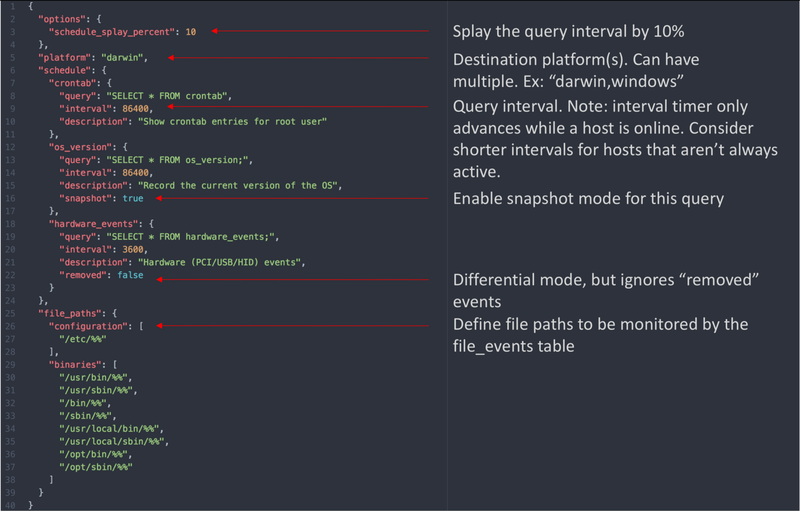 Queries are issued either through osqueryi, an interactive SQL environment, or osqueryd, a long-lived daemon for execution of repeated, scheduled queries. The contents of standard tables as described above are populated when a query executes against the table. This model makes it hard to monitor system properties continually. For example, maintaining a list of running processes over time would require a user to schedule a query of the form SELECT * FROM processes at short intervals. 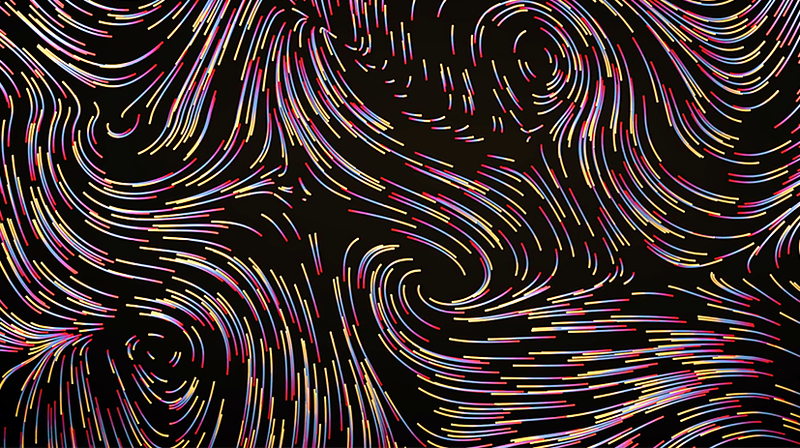 Even then, short-lived processes might fall through the cracks. Event-based tables address this shortcoming by collecting and storing events in near real-time. These tables ensure that events which occurr between the defined query interval are collected in the table and purged based on a user-defined expiration option. Any osquery table that ends with _events is an event-based table, for example file_events, hardware_events, and user_events. The event expiration semantics is described in the osquery documentation. Differential: Initial results are cached and future queries will only report changes since the last query. Snapshot: Query results are not cached and each query will report the current state at the time of the query. "description": "Record the version of the OS when an upgrade occurs"
The first time this query runs it will record the current operating system version because it has no prior data from the os_versions table to compare the results against. Even though this query is scheduled to run every 86400 seconds (24 hours), it will only generate an event when the operating system name or version changes. When an upgrade occurs, two log events will be generated: the old operating system version will be logged with the action field set to “removed” and the new version with the action field set to “added”. This differential query is useful for determining when a specific host upgraded their operating system and to what version, but does not provide as much utility in determining the operating system version for a given point in time. If your osquery logs are centralized, you may have to search far back in time through the logs to find the most recent operating system version upgrade event for each host in order to determine which operating system each host is currently running. With snapshots, the operating system name and version is recorded every 86400 seconds (24 hours). Because the results of this query are recorded daily, searching for the current version of the operating system for a host only requires a search against the last 24 hours worth of snapshot logs. At any given time, you can query the last 24 hours of snapshot logs in your centralized logging platform for results from this query and view an up-to-date dataset containing the operating system name and version for your host(s). windows-registry-monitoring: Ensure sensitive registry keys exist and validate that their current values match expected values. Any events triggered by these queries require follow up investigation. Some of the queries in these packs are tailored to our environment, but we hope that people are able to use them as a reference when building out their own configurations. Auditing does NOT require any audit configuration or auditd; actually, auditd should not be running if using osquery’s process auditing. This creates a bit of confusion since audit, auditd, and libaudit are ambiguous — osquery only uses the audit features in the kernel. Cherry pick the columns desired for process and socket events. Shrinking each individual process and socket event by excluding certain columns helps reduce the total amount of data recorded without sacrificing utility. Filter out process events generated by other monitoring tools that generate a large volume of events. Filter out high-volume process events by creating path and cmdline filters for entries that provide little or no security or forensic value (i.e. date, tr, head). Filter out socket events where the remote_address column contains localhost, RFC3927, and loopback addresses. See our server configuration for examples. Thanks to the rapid response in implementing fixes by the osquery development team, substantial performance gains were implemented between versions 2.5.0 and 2.8.0. Having process and network audit logs from sensitive hosts provides an invaluable source of information for incident response and a great foundation for writing host-based detection rules. While planning our deployment to corporate Linux servers, we made the decision to manage our osquery configuration data using a Git repository. CircleCI is connected to the repository to ensure the configurations are valid and well-formed. After the initial checks have passed, we push the new changes to a selection of non-critical staging servers. After the configuration changes have been validated and we ensure that no performance regressions have occurred, we then push the updated configuration to production servers using a configuration management tool. This is certainly not an exhaustive list of Fleet’s features, but those areas provided the most lift and benefit for our specific deployment scenario. osquery on Windows provides powerful introspection into the registry, WMI, and many other areas that were previously difficult to monitor with a single tool. Instead of attempting to replace existing endpoint security tooling, it serves as the perfect lightweight companion to provide visibility into areas of the operating system that are often ignored by other solutions. A registry key is set by our organization to a specific value and we want to know if that value changes. - Example: The HKLM\Software\Microsoft\Windows\CurrentVersion\Policies\System\Audit\ProcessCreationIncludeCmdLine_Enabled registry key should always be set to 1 to enable command-line auditing. We would like to know if that key ever has a value that is not equal to 1. - However, it is not enough to monitor changes to the key. We would also like to know if there is ever a point in time where the key does not exist on a host. That would indicate that it never got created (misconfiguration) or was deleted at some point (possible attacker activity). A registry key that does not exist by default, but gets created by an attacker. - Example: The key: HKLM\System\CurrentControlSet\Control\CrashControl\SendAlert does not exist by default in Windows. However, if it is created and set to a value of zero, it can suppress crash notifications from making it into the Windows system event log. Attackers or malware will sometime create this key to lower the likelihood of being caught. osquery’s registry table allows us to see the entire fleet’s registry values at any given point in time via snapshot queries. These registry snapshots make outlier analysis absolutely trivial. Additionally, the registry table is also flexible enough for a user to be able to check for the existence or non-existence of a key before attempting to check its value. Microsoft refers to these items as Autostart Extensibility Points, or ASEPs. These are the items in the Windows operating system that run automatically without intentionally being started by a user. They include drivers, codecs, registry keys, and many other areas of the operating system, and are an extremely common way for malware to establish persistence on a host. The autoexec table contains a collection of registry keys, services, scheduled tasks and other artifacts to assist you in identifying and cataloging all ASEPs on a system. Unfortunately, there are currently ASEPs that exist in Windows that osquery cannot yet query such as codecs, shell extensions, etc. The autoexec table is a great starting point, but isn't quite comprehensive for enumerating all Windows ASEPs yet. If you're looking for a way to programmatically catalog and log ASEPs using Sysinternals Autoruns, take a moment to check out AutorunsToWinEventLog - a small script we wrote specifically for this purpose. Another effective strategy is to use osquery for basic outlier analysis. For example, in production environments with rare manual configuration, it is expected that hosts are fairly homogeneous and have the same set of crontab entries and kernel modules installed. By collecting this data from production hosts, it’s simple to use a centralized logging platform filter out the crontab entries and kernel modules that appear on the majority of hosts. The remaining outliers can be examined to determine why they exist in an environment that is otherwise homogeneous. This example is somewhat over-simplified for brevity, but basic outlier analysis can be extremely powerful for identifying malicious persistence items across different operating systems. When a tool exists that enables and simplifies data gathering to this degree, imagination starts to become the limiting factor when hunting for badness. For further ideas and hunt inspiration, use the Mitre ATT&CK Matrix to help scope hunting criteria. Hunts that conclude by identifying misconfigurations rather than malicious activity should not be considered a failure: remediating those misconfigurations may prevent or limit future breaches! We would like to extend thanks to the core developers and third-party contributors of the osquery project for their contributions to the InfoSec community.